Timonium is home to the Maryland State Fair, the Timonium Race Course, almost 10,000 Maryland residents, and unfortunately, plenty of mold. Maryland has a year-round climate that is quite friendly to mold, and unfortunately this includes the Timonium area. Mold remediation services in Timonium help to curb this mold, as families are able to take back their portion of the area’s households. When mold moves in, it spreads and makes itself known quickly, and remedying mold can help you to save your property and your health as you tell mold that it doesn’t belong in your home. The first step in Timonium mold remediation is determining what type of mold you may have in your home. There are thousands of different mold varieties out there, and as many that can grow in Timonium homes, so we want to make sure the mold we’re working with is being eradicated using the right methods. You don’t want to use a remediation method made for mold A on mold B, and you can’t expect the method that works on mold B to work on mold C, so finding out the type of mold we’re working with can ensure we’re also using the best possible method to get rid of it. Some varieties of mold can also be quite dangerous to your health, and if we find we’re working with toxic black mold spores, there will need to be extra precautions taken to ensure spores aren’t spread, breathed in, or allowed to touch the skin. Black mold spores can cause serious respiratory problems, nervous system issues, and skin reactions, and we never suggest homeowners to come into contact with any mold in their home they suspect could be of this variety. How Do I Know If I Need Mold Remediation For My Timonium Home? Mold isn’t always easily spotted, and even when it’s growing in plain sight, you may not spot it until it’s already begun to spread. We often suggest making note if you walk into your basement or any area of your home and notice a “musty” or earthy odor, as this will typically be the first telltale sign of mold’s presence. You may not be able to see the mold, but the odor will point to its existence and growth within your space, and mold remediation for Timonium homes should be sought immediately. By reaching out for assistance in mold remediation as quickly as possible, you’re ensuring that your property and your home will face the least amount of damage, as you’re not allowing mold to spread any longer than it has to. Mold can spread quite quickly, and begin taking over your space in as little as 48 hours from its initial growth. Once mold remediation in Timonium homes has been carried out, we often suggest taking steps to ensure the mold isn’t going to be coming back any time soon. If the mold had begun growing due to water present from a leak or a flooded area, taking care of this problem to ensure water stays out is recommended. If mold simply began to grow due to a naturally damp environment in your home, we’ll suggest investing in a dehumidifier to clear the moisture from the air. 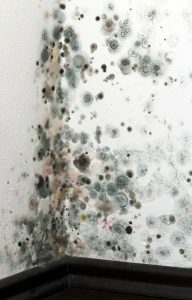 No matter what, if the conditions that started the mold growth in your Timonium home aren’t also remedied, mold remediation may only lead to mold growth occurring once again. The only way to stop mold is to take away what it needs to thrive, and in your home, this means excess moisture. Mold remediation has many benefits, and professional services should always be sought rather than tackling the job yourself. Only the pros will be able to test and treat the mold effectively, while keeping your home and your air safe. When mold is simply allowed to grow, your property and your air is at risk, and you could find yourself feeling sick and losing treasured belongings as mold continues to take over your space. Our mold remediation Timonium services are built to cater to all types of mold found in the Maryland area, and we can help you to regain your confidence in your home. No longer will you have to worry about mold destroying your property, your home, your air, and your health, and there is no home that cannot be freed from the damages mold is known to cause!